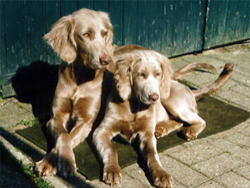 The Longhair Weimaraner is rare, but is recognized by most kennel clubs around the world except in North America. The Weimaraner with its notable gray coat is considered the oldest purebred German fowl hunting dog. There have been purebred Weimaraners since 1878 according to Ernst Richnow of Aurich, Ost Friesland, Germany. He held the position of Secretary of the German Weimaraner Breeders Club, founded in 1897, from 1908 until 1935. The Longhair Weimaraners temperament and hunting traits are the same as the short coated Weimaraner in that they are extremely loyal and driven. The Longhair Weimaraner variety has without question proven excellence in free-ranging field abilities, tracking wounded game and search/retrieve strengths during water work. It is a versatile, well-mannered hunting dog. It's long, thick coat is great for cold, wet hunting days. 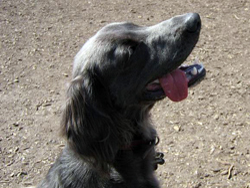 The Longhair Weimaraner should have a soft, silky coat that can be straight or slightly wavy. It has wavy hair on it's ears and soft feathering, much like the Irish Setter has, on the back of it's legs. It has a long, undocked, plume-like tail. The long coat is actually a double coat-a coarse topcoat that repels water, and a soft undercoat that provides insulation in the cold. Like all long coated gun dogs, their coat becomes heavier in cold weather. 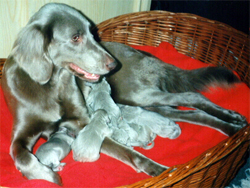 Additional breed information for the Longhair Weimaraner can be found at the Weimaraner Club of America website.